I was captivated by the Rose Alchemy Oracle when I saw it on a stall at the Mind Body Soul Experience in London this autumn and felt I had to have a copy. 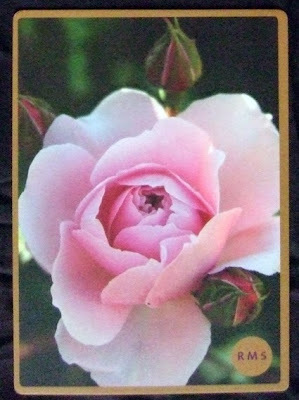 Each card has a beautiful image of a rose on it – and I adore roses. I grow quite a few roses in my garden and often pick a bud or bloom to put on my desk while I am working. When I am stressed – or stuck for ideas – gazing into the petals of the rose and smelling the glorious scent helps me relax and get inspiration. But now, as winter frosts start to bite, there are no more roses for me to pick and I’ve been turning to my Rose Alchemy Oracle. The Rose Alchemy set works in rather a different way from most oracle or tarot decks. Instead of picking cards blind and then turning them over to see what you have selected, with the Rose Alchemy deck you spread the cards out face up and choose whichever catches your attention. One of the deepest gifts the Feminine offers is Wisdom... the perfect counterpart for the Masculine Power. The weave of the two is the dance of creation. The Greek Goddess Athena, also known as Minerva in Roman Times, was seen as the embodiment of this quality; although a warrior goddess she did not do battle with weapons in the physical sense but through her inner sense of the Wise Woman... The Rose asks: What guidance would your inner wise woman offer? The cards - and the messages - are designed for personal meditation rather than to give a specific answer to a question or tell you what the future might hold. I've been putting my card for the day on my desk, propped against my empty rose-bud vase, and using it for inspiration just as I was doing with real roses back in the summer. Okay - the cards aren't scented - but a little essential rose oil solves that problem. 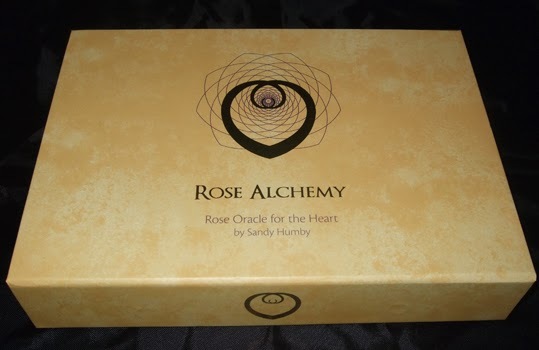 If you are wondering why the word "alchemy" is in the title, the deck's creator, Sandy Humby, says: "I learnt very early on that the rose truly is an alchemical plant... transforming the 'manure' of life into fragrance, beauty and blossom." 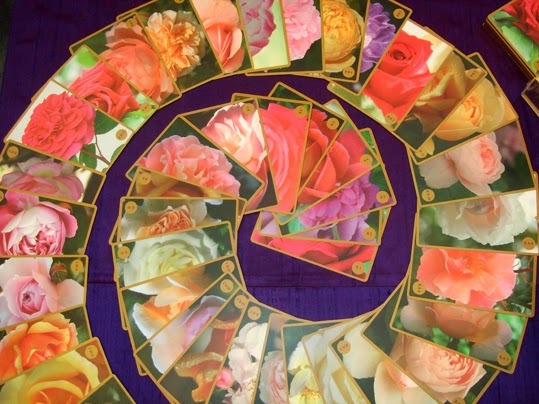 If you are looking for inspiration for gifts, the Rose Alchemy Oracle would make a fantastic present for anyone who loves roses and is into meditation or nature-based spirituality. In the weeks before Yule I am featuring small pagan businesses that produce suitable gifts for giving at the Winter Solstice. If you make or sell lovely things suitable to give as presents for pagans, email me a press release about your products and a photo to badwitch1234@gmail.com. Send me the details of your website, contact email and where people can buy your stuff. I can't absolutely guarantee I'll be able to post on my blog everything I'm sent, but I'll try to do my best.